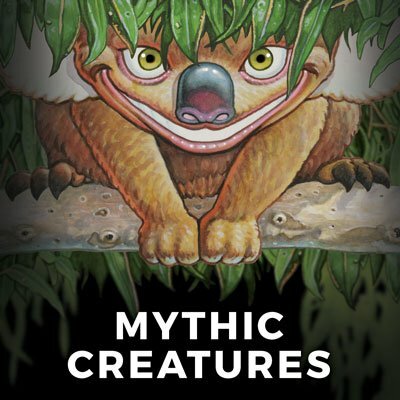 I have gathered together a clever team of humans to help me write, illustrate and document the incredible world of Mythic Australia. Between us, we hope to engage Aussie kids with all things ‘Australia’ and get them excited about their amazing country – which I think is the coolest in the world. 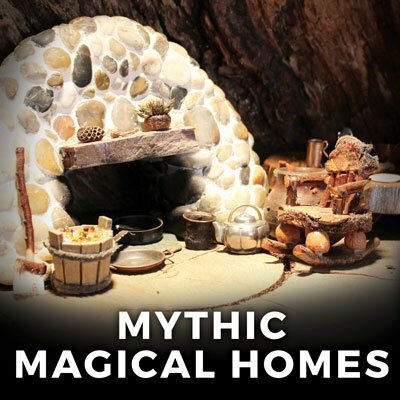 So, I hope you enjoy meeting the Mythic Team – don’t forget to visit their websites as they are very talented people. 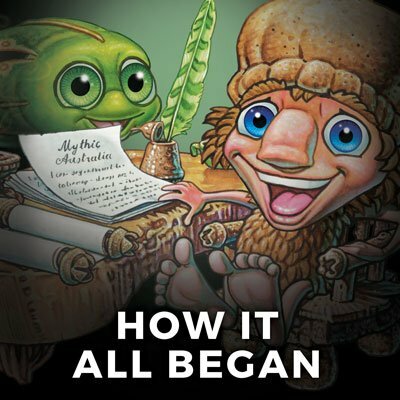 And who knows, maybe one day you may be part of the Mythic Team. When not working on Mythic Australia, Ian is a military artist, illustrator and writer. He is currently the Australian SAS Historical Foundation’s Artist-in-Residence and an Ambassador for the Army Art organisation. Ian has produced a variety of illustrations for books and magazines, and in his capacity as a visual historian, his artworks are on display at museums around Australia, while his military prints are owned by collectors worldwide. Ian is a seventh generation Aussie with a mixed family tree of convicts, farmers and soldiers. Direct members of his family have served Australia in the Boer War, WW1, WW2, Vietnam, Timor and Afghanistan. Ian followed the family tradition and served in the Australian Army, as has his wife and son. Ian’s ambition is to share his love of Australia with others. Through art and story, he hopes to engage Australia’s young generation in their own country’s uniqueness, heritage and often odd customs. Born in Melbourne, Sue has always loved the outdoors and participating in sports and athletics. In the early 80’s, Sue enlisted in the Australian army. She changed from the Royal Australian Corps of Transport to the Royal Australian Signals Corps. Sue served 17 years in the army, attaining the rank of Sergeant, with a 7 month tour in Timor as part of INTERFET in 1999. She honourably discharged from the military in 2001 to pursue a career in IT. Sue is now a Senior Systems Engineer and utilizes her computing skills to administer Mythic Australia in numerous different ways. When not travelling in the outback recording sounds and getting ideas for Mythic Australia, Sue keeps herself fit by competing in the Masters Athletics. She is a respected heptathlete with West Australian records in javelin, high jump, pentathlon and heptathlon. Sue has even won the prestigious WA Master’s Patron’s Trophy. 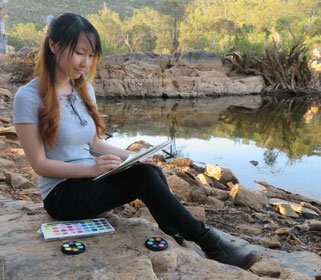 Born in Malaysia, Elin immigrated to Australia at the age of 10 where she instantly fell in love with the unique country’s wildlife, inspiring landscapes and lifestyle. Elin is an award winning fantasy artist and photographer with a Bachelor’s Degree in Art – majoring in Illustration Design and Photography. Though she has only recently graduated, Elin is already a published illustrator collaborating on various artistic projects with Government, Education and Indigenous Departments. 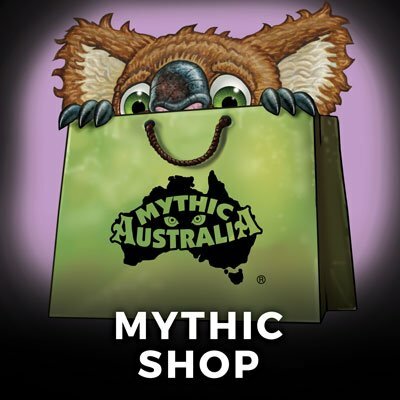 Mythic Australia has been a great outlet for Elin’s creative energy as it combines her love for fantasy art with her love of Australia. David Webb’s newspaper career began as a cadet journalist in Melbourne in 1953 and ended as editor-in-chief of The Sunday Times, Perth, in 1987. In that time he held many editorial positions – as reporter, feature writer, sub-editor, editor and occasional columnist – on newspapers in New Guinea, Sydney, Mount Isa, Adelaide and Perth. After leaving newspapers and settling in Perth, he continued his writing as a self-employed publicist for local organisations. An earlier association with a former newspaper colleague (by then an established international book publisher based in Singapore), led to writing titles such as Your Body, Your Choice (Media Masters, 2000) and Joe, the Blue-eyed Cockatoo (a true adventure story about a rare New Guinea parrot, illustrated by Ian Coate). Further editing and writing followed, as well as co-authoring WA-based books with fellow journalist David Warren, including Beyond the Round House (Longley Books, 2005) and Safe In Our Hands (PMH Foundation, 2009). David now lives in Queensland where he moved to be with family after his wife, Susanne, passed away in 2013. 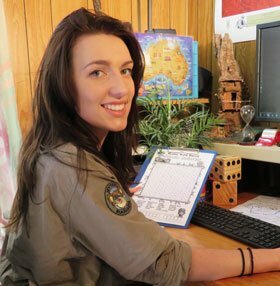 Elishah is a primary school teacher that has a real passion for Australia and is very proud of being an eighth generation Aussie with a mixed family tree of convicts, farmers and soldiers. 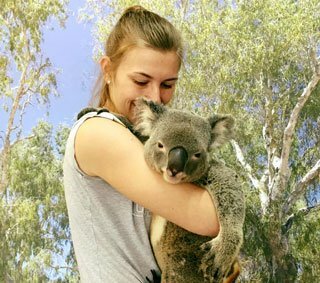 Elishah hopes to inspire her love of all things Australian in her students and spark their interest so they put down their ipads to explore the outdoors. To this end, Elishah has created a library of fun Aussie worksheets and activities that is now ‘free to download’ for teachers and parents alike. 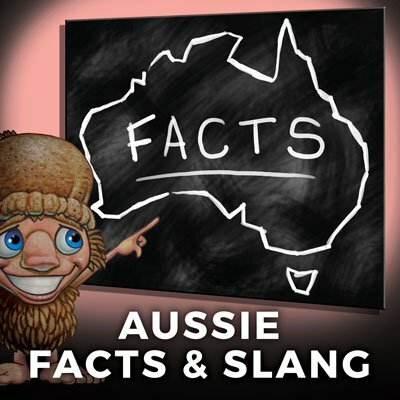 Check them out on the Free Resources page and add a tru-blue Aussie flavour to your classroom. Joelin’s happiness in art comes from being able to evoke feelings through digital paintings; to create the characters and stories in her mind. She is fuelled by milk tea and falls in love with fantasy worlds; which drives her to passionately illustrate work that is compelling, meaningful and fun. Matt grew up in Bristol, England, an area famous for its influence on (famously associated with) Jane Austen, and J.K Rowling among others. His love of literature was evident from an early age, and counts Roald Dahl, Enid Blyton, and Beatrix Potter among his favourite authors. Matt first came to Australia as a university student, where he thankfully met a girl and together they’ve since travelled home and abroad extensively. Currently, Matt is a paramedic, with hopes to one day visit the penguins of Tasmania- the state he forgot when backpacking. 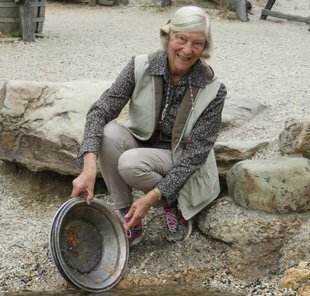 Adventure certainly has surrounded Caroline’s life: growing up canoeing and camping on the Blackwood and Murray Rivers, fossicking for gems or old bottles in the Goldfields or lazing on beaches. In her early 20’s, Caroline found the city a little too crowded and decided to seek work in the Kimberley at a station at the top of Western Australia. Here she met her husband, Alan, who owned Kingston Rest Farms, 70km out from Kununurra. Life suddenly had many challenges that Caroline and Alan battled through together like unexpected floods, fires and locust plaques. She even found time to enlist in the army-reserves (with Norforce) and have three children. Having no schools close by, Caroline had to enrol their three children in Kimberley School of the Air. With no formal teaching skills, Caroline took on the teacher/ parent role, and in time became very passionate about it. Today, Caroline and Alan live on a sheep and beef farm south of Perth with a whole lot of new challenges and adventures. Dave grew up in a rural town in Southern England, a son of an Ironmonger. 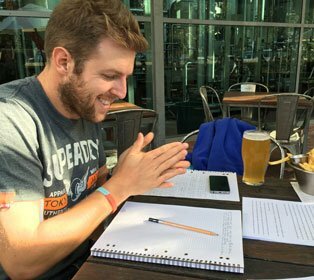 While studying Building Surveying in London, Dave met his future wife, Gay, an Aussie girl whose father was an Australian Officer seconded to the British Army. In 1973, Dave followed Gay back to Perth, as a Ten-Pound-Pom, and started work as an Estimator in Construction Engineering. With a career spanning 35 years, he worked on prestigious projects, such as: the North-West Shelf, the second Narrows Bridge and the Forrest Highway. 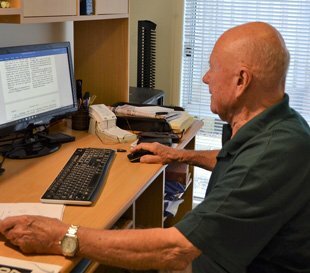 Dave retired as Senior Chief Estimator for WA, but today is busier than ever. 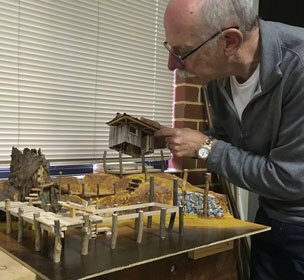 As well as creating amazing models and dioramas for Mythic Australia, Dave coaches and participates in Masters Athletics. He has won many medals at a state and national level and coached others to do the same. As a young boy in Holland during WW2, John survived the bombing of Eindhoven. In 1952, at the age of 13, John immigrated to Australia. Within days of arriving, John was droving and fencing in the Australian Alps. Later, John moved to Ballarat and became an A-grade Welder and Turner & Fitter at the School of Mines. It was at Ballarat where he met his wife, Eileen, and started a family. Moving to Geelong, John worked for Ford in charge of automation (maintenance) for two years. Wanting a change, John joined the Victorian Police Force which became his career for thirty years. 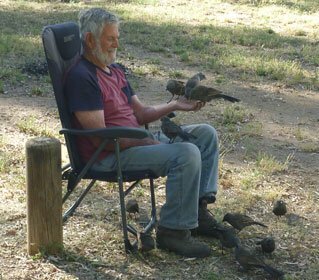 Now John is retired and whenever possible he and his wife join the ranks of the Grey Nomads in their motorhome to wander around Australia. 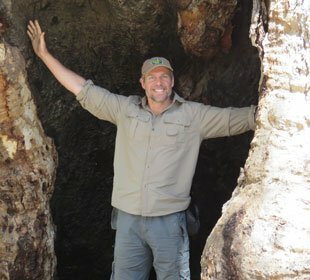 Kevin is a renowned bush guide, ornithologist and naturalist, with a background in forestry. He has published numerous original observations on the natural world. 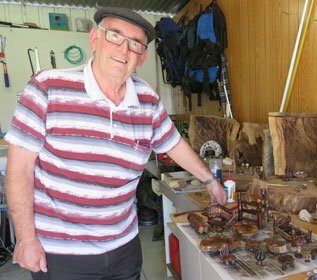 In 2009 he was awarded an OAM for recording natural history of Western Australia and service to conservation. Kevin’s love for the Australian bush has led him to take like-minded people by land, sea and air to some of Australia’s most remote and least known places. In June 2000 he won the State’s top guiding award – the Facet Golden Guide Award. In 2001 he was a recipient of a ‘Premiers Award to Legends of the hospitality and Tourism Industry’, a one-off award that marked the start of the new millennium and the contribution of individuals to those industries over the previous 30 years. In the south-west of Western Australia, there is even a road, Coate Road, named in his honour – a reminder of his forestry days. 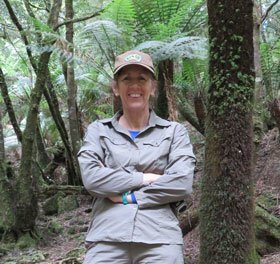 Yvonne is a sixth generation Australian from a dairy farming background at Margaret River. She grew up experiencing the end of the old era – before refrigeration, electricity and scheme water, onwards to the present digital age. From the mid 1970s, Yvonne and Kevin were involved in nature-based tourism extending over the whole of Australia. 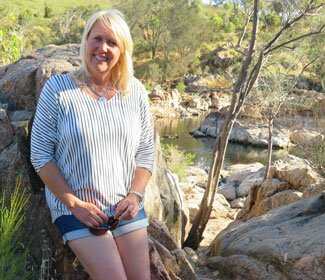 Between raising four children and running a business, Yvonne became a foundation member of the Western Australian Genealogical Society and their Inaugural editor. In 2014 Yvonne was elected as a ‘Life Fellow’ of the Society. 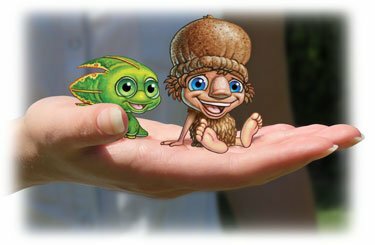 Since early childhood, Chris has always had a passion for exploring fantasy worlds such as: C.S. Lewis’s Narnia Series and J.R.R. Tolken’s Lord of the Rings. He is an avid reader and few can match his knowledge on the Star Wars and Marvel Universe. Even though Chris has embraced his ‘inner nerd’, he is far from being nerdy. 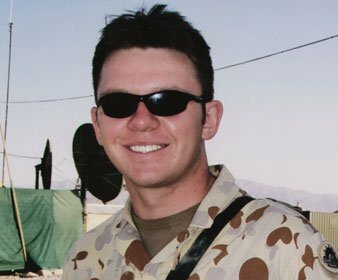 In 2004, he enlisted in the Australian Army and since then has been deployed twice to Afghanistan. Chris has travelled the world with the military and seen the best and worst of human nature. 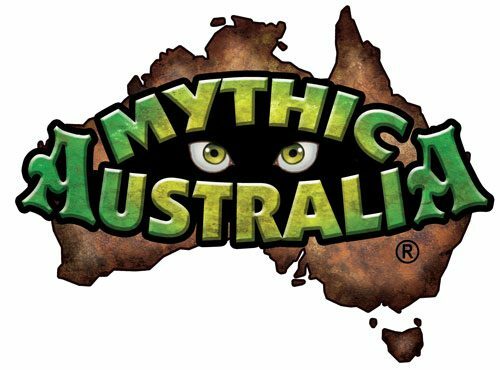 His love of fantasy combined with his life experience has been an invaluable asset creating the Mythic Australia Universe. 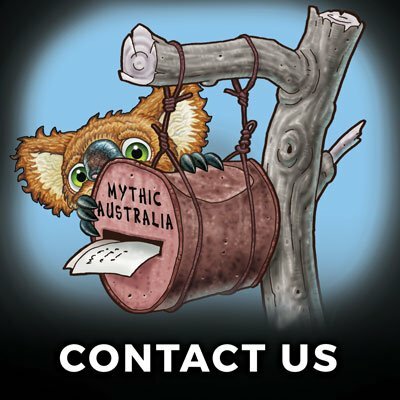 Rachael has grown up with Mythic Australia being discussed around the dinner table. 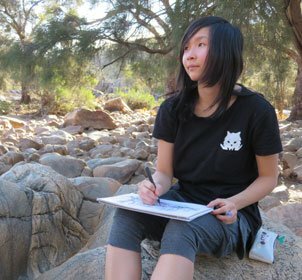 She has contributed and enriched the Mythic Australia Universe with her many concept sketches and ideas. 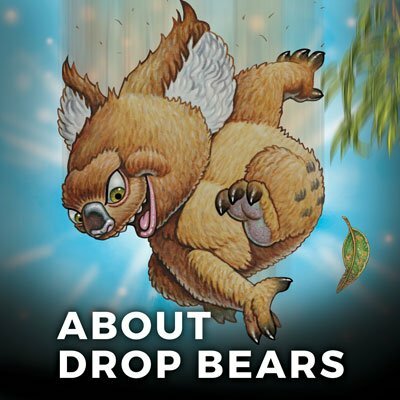 Over the years, Rachael has modelled for many of the book illustrations; primarily, Rachael is the bush walker in the first Mythic Australia book: Drop Bear. Rachael has always been very athletic and in 2012 she came fourth in the Australian under 20s High Jump. After university, Rachael lived in England for two years with her partner, Matt. They both worked in medical fields and added to their life experiences travelling Europe. Today, Rachael is a registered nurse studying midwifery.